This month's TOTM belongs to surewhynot. "It's a 79 Bronco with a 400 and c-6. I bought it to give the kids and my nephew something to play with when we go to the mud hole on the weekends. After some camo spray bombs it was ready to go. We took it mudding a few times on the 31" tires that came with it, but soon realized something better was needed. We didn't want the expense or hassle of doing a lift kit, so out came the sawzall. It now sits on 40" ground hawgs, with no lift and a lot less fender. The kids have a blast in it, that is what it is all about to me." This month's TOTM belongs to Skandocious. Chris' truck is a 1995 F150 Centurion Crew Cab 4x4 with a 351W V8. The truck started its life as a regular cab shortbed, before it was shipped to Centurion to be cut and pulled into a Crew Cab. He bought the truck in August of 2006 from a family in California that kept it in near perfect condition. The previous owner installed Pro-Comp 4 inch lift, as well as new wheels and a camper shell; work done to the truck since he bought it includes Warn manual hubs, custom exhaust, 4.10 gear swap, electric Taurus fan, Auto-Meter trans temp gauge, and a Derale cooler transmission pan. The truck has become an instant member or Chris' all-Ford family and he plans to keep wrenching on it for years to come. This month's TOTM belongs to bobf100. "My 1956 F100 was purchased at a swap meet in 1991 and immediately disassembled for low cost backyard rebuild. In 1998 while the rebuild was in progress I won the No Limit Pro-Tech chassis grand prize giveaway at the F100 Super Nationals. Starting over again with the new chassis little was kept of the original truck. The cab, one door and three of the running board brackets are all that remain of the original truck. I completed much of the work in my two car home garage. That work includes rebuilding of the driveline, completion of the chassis, rough bodywork, initial fitting of the body parts and the oak bed strips. In 2004 the truck was delivered to Doug Jenkins Custom Hot Rods for final bodywork and paint, assembly, interior and wiring. The truck’s first show was the 2005 World of Wheels Car Show in St. Louis where we won “Best in Class” and “Outstanding Achievement”. This truck is a driver and my wife and I hope to accumulate many miles behind the wheel. I’m honored to be chosen for the TOTM and proud to represent the members of this site." This month's TOTM belongs to Slmann. 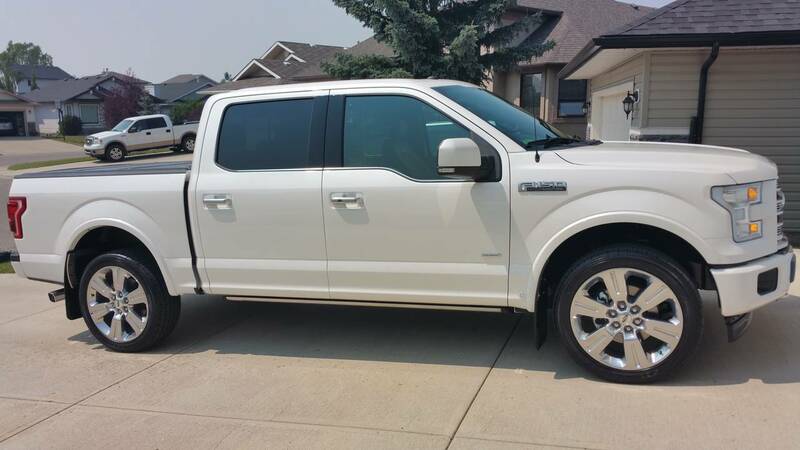 Scott's F-150 is a 2004 model with the XLT package. The truck is equipped with 4x4 and has the 4.6L V8 engine. Scott keeps his truck in tip-top shape, and it shows! With the new wheels and the care Scott takes of his truck, you could consider it an everyday show truck. Congratulations to Scott for earning September's TOTM. for longevity. She just turned over 140K miles, and is his daily driver. A friend gave him a set of alloy wheels from a 1993 Explorer, which he installed with a new set of Michelin LTX M/Ss last fall. Congrats to Bob for gettin August's TOTM. This month's truck belongs to CaFordDude. It is a 2006 F350 CrewCab Lariat FX4 PSD Dark Stone exterior with Tan Leather interior. Has everything but navigation and sunroof. Bone stock and will work harder then 1000 angry oxen. Aaron loves his truck! This month's Truck of the Month belongs to JeffH. It's a 1950 F3, bought new by his own Grandfather. This truck is known as the "Big Tank," and has been used in the family for farmwork as long as it's been around. This monster is a work in progress, and was an easy choice for Truck of the Month. This month's Truck of the Month belongs to Beachbumcook. It's a 2003 Excursion Limited Edition with the 6.0L PSD. This truck is affectionately known as the "Bus" by Jeff, and that's just one of the reasons we chose it as truck of the month. This month's Truck of the Month belongs to Shocker. It's a 1987 Ranger 4x4 with a 302. The truck is modified to tear up the trails, and that's why we selected it for truck of the month. Congratulations on being nominated for the truck of the month! This month's Truck of the Month belongs to Blue Goose. It's a 2005 F-250 Superduty Harley Davidson Edition pickup truck. Congratulations on being nominated for the first truck of the month!